Lemvard on his way to World Touring Car Series? Jack Lemvard is very busy these days, running in the Honda Racing Fest in Thailand where he is leading the Civic One Make challenge, and he is also leading the Asian Touring Car championship which rotates through several countries. 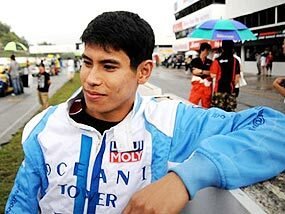 The 23 year old driver was given a further boost by his team and sponsor, Ocean 1, with a promise of a drive in the World Touring Car Series should he win the Championship this year. “We are far ahead in the points now and it would be hard for anyone to catch up. So it looks like my dream is coming true,” said Lemvard. Rounds 8, 9 and 10 of the Asian Touring Car Series and Rounds 6 and 7 of the Formula Asia 2.0 were held during the Asian Festival of Speed at the Bira Circuit in Pattaya August 15-17, 2008. The newly introduced Asian Touring Car Super 1500 Max Challenge was also in the line-up at the circuit. Last week I asked who was the first non-Italian driver to win the ‘proper’ 1000 km Mille Miglia? The answer was the German Rudolf Caracciola (despite an Italian sounding name) in 1931 driving a Mercedes-Benz. The next ‘foreign’ driver to win was Stirling Moss in 1955 in another Mercedes-Benz, the 300 SLR. A German crewed BMW won the race in 1940, but this was a closed circuit event and not the ‘proper’ Mille Miglia. First correct answer in was Mo Bertrand. Well done Mo. So to this week. Archie Scott-Brown was a driver of incredible courage, competing at the top level with only one usable arm. There was another driver, an American, who won championships on both dirt and asphalt with one hand and a hook. What was his name? Do you remember when you used to put a piece of plastic on the front forks of your bicycle so that it made a ‘vroom’ noise with the spokes as you pedaled along? Well, Lotus have seized on our childhood technology and adapted it to electrically driven cars! Full electric and hybrids have a slight problem in the fact that they are veritably without noise when running along. This means that pedestrians are unable to hear and anticipate, so drivers will have to carry special polish to wipe the nasty smears off the front of their cars before they go home. Lotus call it their “safe and sound hybrid technology” which simulates the traditional noise of an internal combustion engine. Stealthy hybrids and electric cars have come in for criticism from groups representing the blind and partially sighted, concerned that the low hum of the vehicles puts those with imperfect sight at greater risk of being hit on the roads. Some are almost silent at slow speeds. One US study found electric and hybrid cars moving slowly had to be 40 percent closer to pedestrians than conventional vehicles before their location could be detected. They have no noisy pistons, internal explosions or fan belts which cause the roar we associate with the traditional car engine. Hybrids pose the same basic problem. At low speeds, the electric motor takes over, making them very quiet. Lotus has already put the system into a Toyota Prius, one of the most popular hybrid cars on the market, with over one million of them whistling noiselessly past. The device kicks in automatically to produce an artificial engine noise when the hybrid car runs on its electric motor. When the car’s combustion engine takes over, sensors fitted to the engine and suspension turn off the sound. The engine noise is produced by a waterproof loudspeaker positioned next to the car’s radiator, making it appear as if the sound is coming from under the bonnet. The system produces a noise of the pitch and frequency designed to help pedestrians identify the car’s speed and distance, says Lotus. It is claimed that Lotus adapted the system from technology previously developed to block outside noise from the inside of its cars; however, you and I know it came from our bicycles. Lotus hopes that manufacturers of electric and hybrid cars will adopt the technology, which it says can also be retro-fitted at a very reasonable price. After all, how much did it cost us with one piece of plastic poking out between the wheel spokes! Nissan has indicated its intention of being at the forefront of electric power technology, stating that they will release an all-electric vehicle in 2010. This looks like being a race between GM and Nissan, as both have said that their electric vehicles will be in the showrooms in 2010, but don’t stand hopefully outside their new car showrooms on Sukhumvit Road. It will be a while before we get them in Thailand. Nissan has already developed two prototypes, developed under the ‘Nissan GT 2012’ business plan. Nissan wants to be thought of as leaders in the ZEV (zero-emission vehicle) market and their technology will allow them to release the ZEV cars in 2010 and subsequently launch it globally in 2012. Nissan is using advanced lithium-ion batteries (similar in principle to the types used in laptops) and the all-electric EV-02 features a front-wheel drive layout, but its propulsion is provided by a newly developed 80 kW motor and inverter. The laminated compact lithium-ion batteries are installed under the floor - an arrangement that means not having to sacrifice either cabin or cargo space, according to Nissan. Nissan’s lightweight compact lithium-ion batteries use unique laminated cells. Power output is improved by 1.5 times while battery volume is reduced by more than half compared with conventional cylindrical lithium-ion batteries. 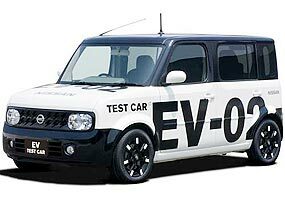 Although Honda and Toyota are better known for their hybrids, Nissan has long experience in electric-powered vehicle development, commencing with its first EV ‘Tama Electric Vehicle’ way back in 1947. Nissan also claims to have introduced the auto industry’s first application of lithium-ion batteries in the Prairie Joy EV in 1996, followed by the ultra-compact Hypermini electric vehicle, released in 2000. There is no doubt in my mind that the future is plug-in rechargeable electric power. We have made batteries for mobile phones that fit in our pockets, remembering that just a decade or so ago they were so heavy you needed weight lifting training to carry one. Electric power also frees us from the tyranny of the oil producers and refiners, which has to be a step in the right direction. 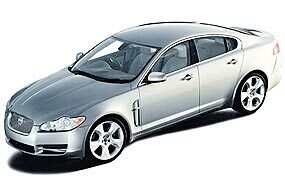 The new Jaguar XF range has been released, believed to be the car to revive Jaguar’s flagging fortunes. However, with Jaguar having been bought from Ford by India’s Tata Motors, there has now been enough money to put jam on the table, as well as bread and butter. Some pundits have described the new XF as the “best looking and most daring Jaguar sedan in many years, conveying a lithe, low presence that is both modern and elegant.” For my money, it looks a little too much like everything else, particularly the Lexus, rather than being a break-through Jaguar styling exercise. There are four engines for the XF models. A 2.7 liter diesel V6 and 3.0 liter petrol V6, a 4.2 liter petrol V8 and the 4.2 liter supercharged V8. Standard gear, includes leather upholstery, sat-nav, dual-zone climate control, six-speed auto, keyless starting, powered front seats with driver memory, power steering column adjustment, an electric parking brake, cruise control with speed limiter, six-CD audio, Bluetooth and aux and USB interfaces. About the same as everyone else, when you break it down. After all, sat-nav has been around for 10 years, driver memory electric front seats for about 20 years, cruise control for 30 years and leather seats for 70 years. For Jaguar’s sake, I hope it is a huge hit, but it has some very stiff competition from the Mercedes E500, BMW 550 and the Lexus GS 450H. However, if the vindaloo can keep the price down, there will be a market, albeit very limited.